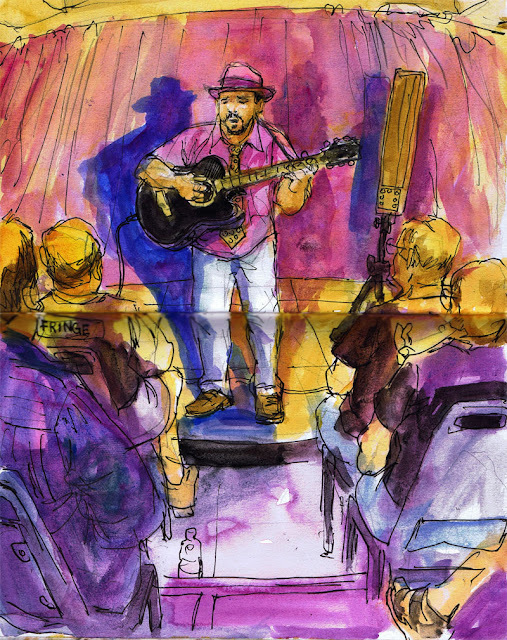 Analog Artist Digital World: Paul Strickland: Jokes, Songs, a Hat, Etc! Beth Marshall was the producer of Paul Strickland's show at the Orlando Fringe Festival and she suggested I see and sketch the show.There was a line of people outside the Brown venue in the Shakespeare theater and I muscled into line. A volunteer scanned my ticked and then asked, "Do you have a button?" I said, "Of course." and pointed down at my bag that was covered in buttons. Looking down, I realized my Fringe button had fallen off. Thankfully she didn't notice. I sat at the center of the top row of the bleacher seats. Jeremy Seghers and members of his cast from Mysterious Skin sat around me. The author of the play had been sent a link to the blog post and apparently he loved the sketch. I was flattered. A green light from the lighting tech booth illuminated my sketch as the room grew dark. Actress Sarah Villegas was visiting from out of town with her boyfriend. She had been in Fringe shows since she was 14 and this was the first time she came as a visitor. She said she missed Orlando and the Fringe in particular. Paul's show combined comedy and music in a perfect blend. Many jokes centered around his feeling old at 30 yet they resonate even more when you hit 50. The woman seated directly in front of me laughed so loud that she set off a chain reaction of laughter. I identified with that strange feeling he got when a child stared at him. For some reason, children always stare at me on airplanes or in supermarkets. It is unnerving. Anyway he decided to warm up to this particular child and he made cute faces and said "Where can I buy one of you?" That would be fine he realized, unless the child was black! He performed My Way which is a song any artist who forges their own path can identify with. You have one more chance to catch his show today, Sunday May 27th at 12:30PM. Tickets are $11. This show can be an exclamation point to your Fringe experience.